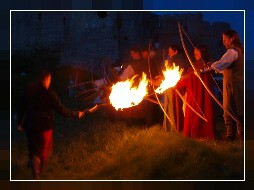 Wolfshead Bowmen Events Group can offer an event in a certain medieval period, between 1200 and 1485. We can offer an interactive presentation, incorporating costumes, activities and tools, to give the public a sense of stepping back in time. If required we can reenact a specific event in the history of a castle or place, although reenactment is not our main goal. 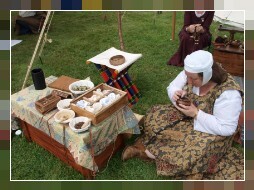 We pride ourselves on bringing historically correct medieval entertainment; what we offer is an educational entertaniment like living history, bringing handcrafts, clothing styles, pastimes and everyday life from the late Middle Ages. 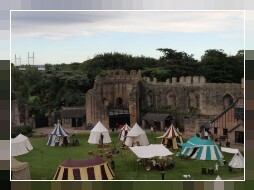 We provide an encampment of replicas of medieval tents with a raised fire. We ensure that no modern equipment is visible to the public. We can provide educational trails on the grounds for a part of the day. We can bring a castle to life, with our cooks in the kitchen, the lady and her ladies in waiting in her chambers doing needlework, children playing games, the lord and his justice, sword practice in the courtyard, a meal in the great hall, the fletcher making the arrows. In the afternoon we can practice our archery skills in a demonstration. We will bid the visitors to the castle a warm welcome and will be happy to answer any questions. For an extra special show we can provide a short demonstration with burning arrows.